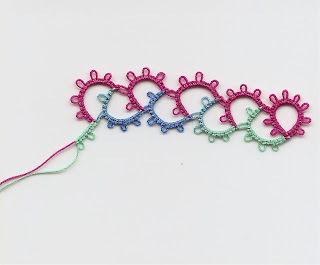 snowy's tatting: Frustration and slow progress. I have at last finished this edging, however it is just too small for a standard hanky. Here it is laid over a plain white handkerchief. This shows just how much too small it is. I also made a square of Frivole's working of Pomegranate with corner. The thread is from Tatskool, and is Coral Reef. 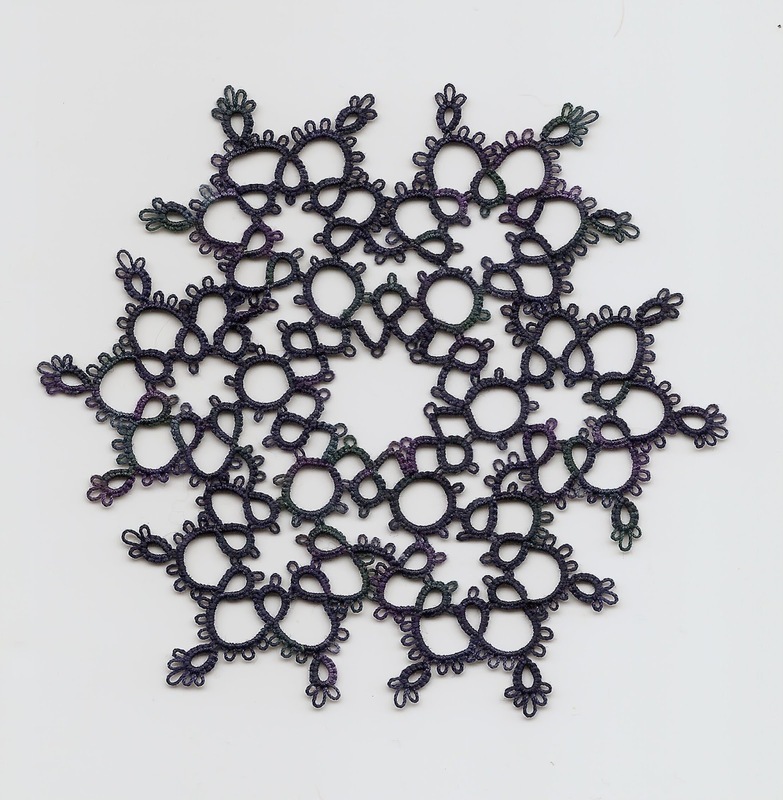 This was just an exercise, I haven't thought what I could put in the centre, a doll's handkerchief perhaps! 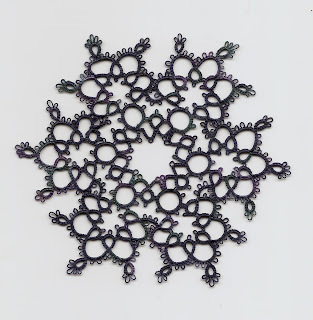 This snowflake is made in Tatilicious' thread called "Grackle mess". The name fascinated me, and I thought Jess had made up the word Grackle, except that she mentioned plumage, so I googled it, and sure enough a grackle is a bird, somewhat similar to an European starling. 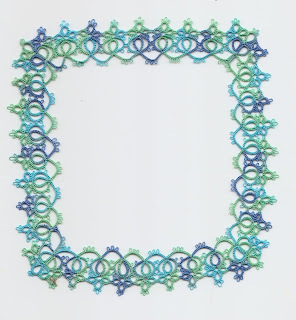 In real life this thread captures that mixture of blues, greens and a touch of purple, but sadly neither she nor I can find a way to reproduce it on the computer. :( The pattern is from the site Be-stitched, and is called Jan 2007 snowflake. I recently went to Amazon.de and bought this book. I am fascinated by the peacock, but probably need my life to be a little more settled before I try something so complicated. (We are trying to sell the property where we live, anyone fancy buying a gite complex in France?) I am forced to spend most of my time trying to declutter and clean, this in tandem with my studies for a university degree, a full time job and all the responsibilities that being wife and mother bring! Grumpy, me, no! 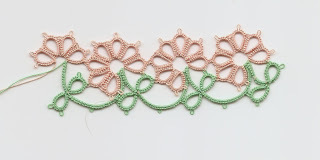 However I am a bit frustrated that lace-making is being relegated for the moment. Well back to the pattern above, it is a classic, and this is the author's personal working of it. I was just doodling along with it to use up thread on the shuttles, but then I made a mistake, so I will probably cut it off there. I had pretty much run out of the green anyway. This is another shuttle emptying exercise from the same book. You've been very busy!I don't think the edging is too small for the hanky - it looks good overlapping the cloth like that. 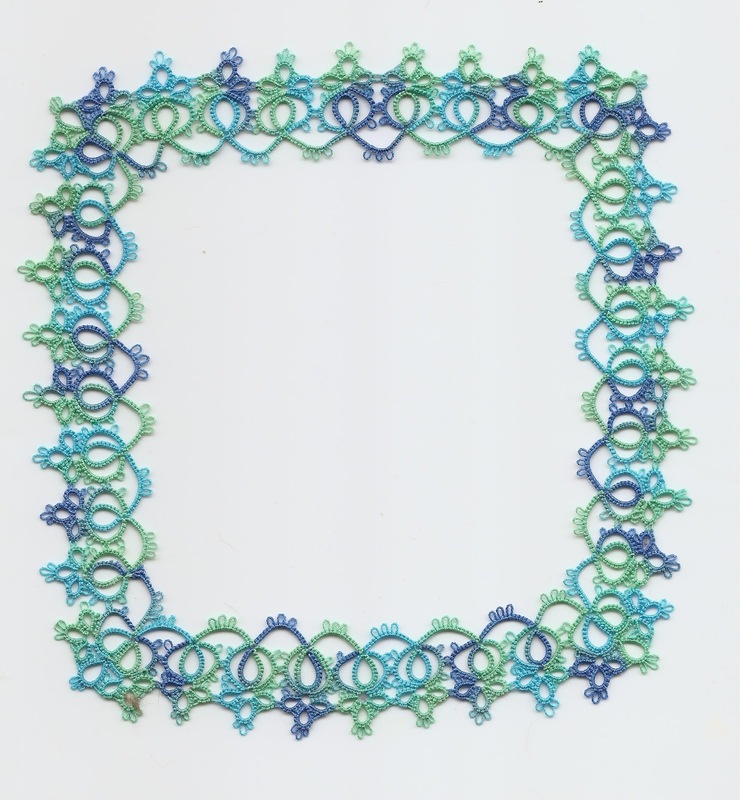 Lots of pretty tatting here. You can get a piece of fabric, cut it to size, and hem stitch it to make a hanky to fit your lace. A little time consuming, but I've done it before. Snowy, your tatting is delicious as usual! I owe you an email... I will try to get to it today! Fox, I am happy to know that grackles conjure up something tangible, :) I can't help thinking of grockels, which is a West-Country epithet for tourists! Oh my, I've enjoyed your blog for a while but your gite! How beautiful! I wish we could, we'd love to buy it! Beautiful work...the blue border is marvelous. We get grackles in our yard periodically, they seem to chase away the doves and pretty little finches and things...and are noisy and a good bit annoying, your comparison to tourists made me laugh and is really quite apt. The neat thing about being a crafty person is that often you have crafty friends. 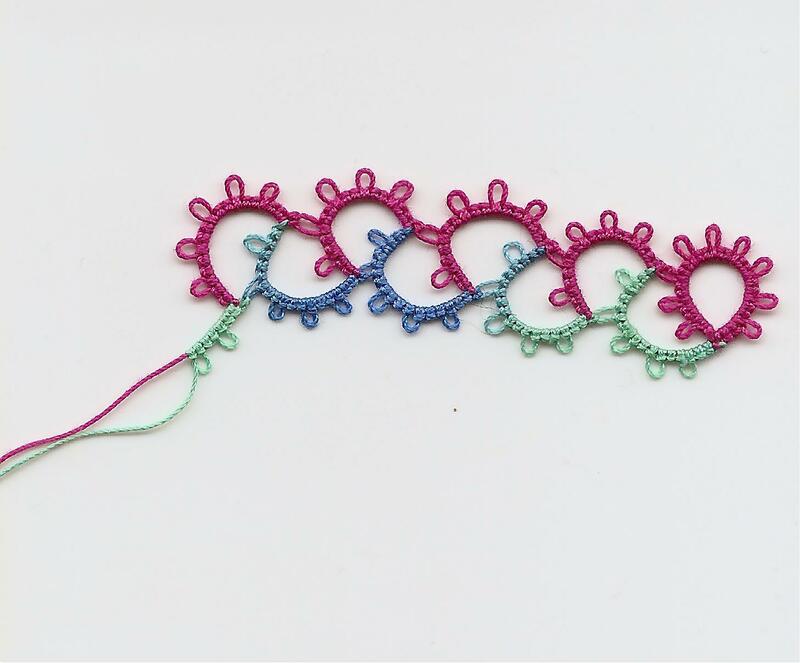 Maybe a friend would sew the hanky to size or sew the tatting as an overlap. It is so beautiful, I hate to think of it sitting in a box and not being admired.